A London pub, an English village, a shell-hole on the Front, the outskirts of Thai Nguyen city, a ship in heavy weather off Zeebrugge, a civilian internment camp… Loves and griefs that must remain unspoken, unexpected freedoms, the tensions between individuality and duty, and every now and then the relief of recognition. You’ll find both heartaches and joys in this astonishing range of thought-provoking stories. As the centenary commemorations for World War I begin in earnest in 2015 (and will continue for the next few years), this anthology is perfectly timed. War brings all kind of suffering, to combatants and civilians, to those fighting with their comrades in numerous armies, and to those still at home. Among the hundreds of thousands who fought, died, loved, lost and suffered were people of the LGBTQI community who experienced the additional stress of being unable to publicly acknowledge their experiences – both the horrific and the joyful. 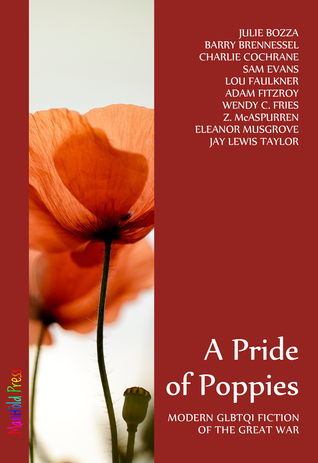 A Pride of Poppies is a superb collection of stories that give voices to those who were silenced by the mainstream at the time. The stories are told across a rich array of experiences, including an intersex man facing his choices on enlistment, a ‘lesbian Lothario’ providing company to the women of her mail route, men in a German internment camp in England finding comfort in the midst of trauma, a bereaved mother visiting the sickbed of a wounded man who was her son’s particular friend, and two young men in French Indochina finding strength in each other as they struggle in their occupied homeland. There are stories in the trenches, at sea, on the English homefront and in far-off places where the war’s impact is unexpected. But don’t get the idea that each one is a story of sorrow and misery. Far from it. There is so much love and hope in these tales, too. Happy endings as well as heartbreaking partings. The broader experience of the whole of humanity is reflected in these small and personal love stories. Every story is a gem, though a few shone a little more brightly for me. 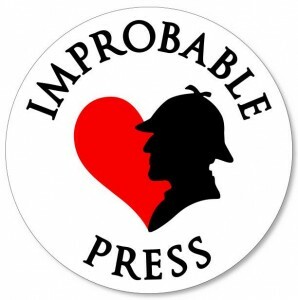 I am an enormous admirer of Wendy C Fries Sherlock Holmes stories, and her beautiful contribution, I Remember, is lyrical and had me happy-weepy, sorrowful and glad for Christopher and James who can only write in a kind of code to each other. Eleanor Musgrove’s Inside, set in an civilian internment camp, shows life for those deemed ‘enemy aliens’ in a sympathetic light. At the Gate by Jay Lewis Taylor is another that had me tearful for the man who could not be seen to mourn too much for the man he loved. Julie Bozza (author of the excellent The Fine Point of His Soul) gives us the fresh and lovely Lena and the Swan, or The Lesbian Lothario. A Pride of Poppies opens a window many lives affected by The Great War, not just in Europe, not just on the battlefield, but for so many lives changed and challenged in so many different ways. The authors and publishing house all donated their efforts to this book, and a minimum of 60% of the proceeds are being donated to the Royal British Legion, which runs the UK’s Poppy Appeal. But don’t buy this wonderful anthology for that reason. Buy it because it’s a damned fine read which will break your heart, fill it with hope and remind you that love will find a way to grow, even under the harshest conditions. Read more about A Pride of Poppies and the anthology authors at Manifold Press.